What is it about Sidney Crosby that he can’t buy respect? Seems that either hockey fans love him or hate him. But those who hate him don’t seem to be saying “I respect that he’s a great player but I don’t like him”, or “I don’t like this particular aspect of his game” or whatever, it’s more like they think he’s overrated and simply not that great a player. I don’t understand this. Most importantly, he took the Penguins from worst team in the league to Stanley Cup contenders in three years and Stanley Cup champs in four. Sure, he didn’t do it alone, Messrs. Malkin and Fleury helped, among others, but the acquisition of Crosby by the Penguins turned that team around in a big hurry. He’s been called a whiner, but so was Gretzky when he was young, and if that’s the worst thing you can say about a hockey player, that’s not bad. 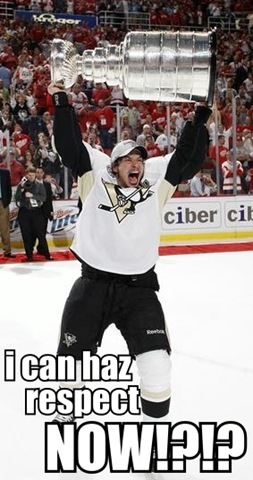 People can have whatever opinion about Crosby that they want. Is he the best player in the league? Probably not, I think Ovechkin has him beat there. It could be argued that given Evgeni Malkin, he’s not even the best player on his own team. But given the stats above, I don’t understand how anyone can question that he’s one of the top five. Note: the picture was stolen from nhLOL.blogspot.com. This entry was posted in Hockey, Sports on June 17, 2009 by Graeme.